The present. Burnow Island. 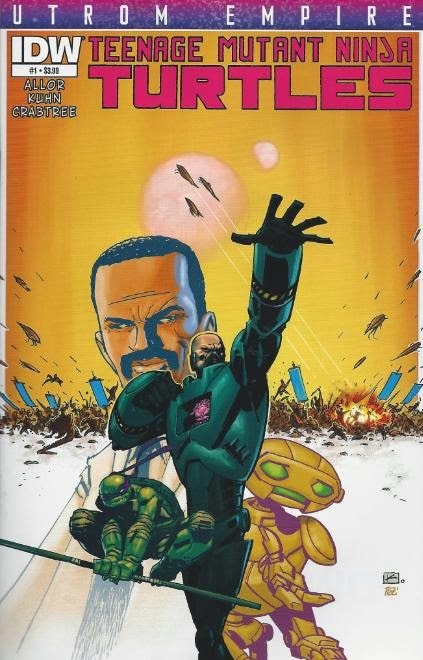 As his head is hooked up to numerous probes in a laboratory, the Fugitoid (alias Chet Allen, alias Professor Honeycutt) reflects upon the family he lost at the hands of Krang and fantasizes about killing himself. The human scientists working on downloading the Fugitoid’s data in order to complete the Technodrome decide to close shop early for the night, as a major storm is about to blow through. In his office, General Krang orders other technicians to make sure the storm does no damage to the Technodrome project. They assure him that everything has been accounted for. Little do they know, Baxter Stockman is outside, fooling with a power box. The past. Prehistoric Earth. A pair of Utroms take a DNA sample from a triceratops. 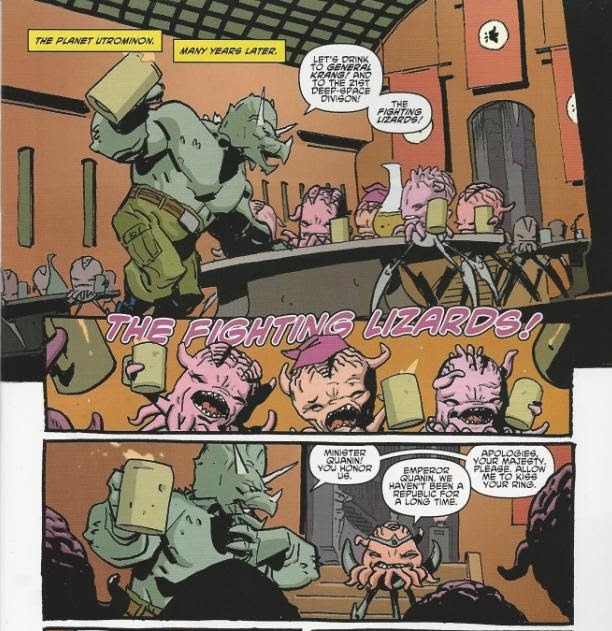 Many years later, on the planet Utrominon, General Krang throws a banquet for the Triceratons, the enforcers and “Fighting Lizards” of the Utrom army. Emperor Quanin breaks up the festivities and asks his simpering son Krang what’s going on. Krang explains that they have successfully conquered the D’Hoonib Empire and nullified the Praxoid Alliance, placing the Utrom Empire in a state of peace. Some years after that, in the Molta VI Asteroid Belt, an Utrom expedition for more ooze is wiped out by a rebellion comprised of many alien races, including Neutrinos and Triceratons. Back on Utrominon, Senior Member of the High Council Lorqa implores Emperor Quanin to cease his foolish expansion of the Utrom Empire. They’ve spread out beyond their ability to functionally colonize, draining their homeworld of all its precious resources. General Krang butts heads with Lorqa for disrespecting his father’s commands. Quanin breaks up the argument and insists that so long as the citizens on Utrominon are ignorant of the situation and remain at peace, then nothing else matters. The present. Burnow Island. Baxter’s sabotage causes the power to go out and he sneaks into the laboratory housing the Fugitoid. He reactivates the Fugitoid, though he’s unaware that the Fugitoid and his former employee Chet Allen are one in the same. Baxter asks the Fugitoid to help him betray and destroy General Krang. The Fugitoid recalls having heard that Stockgen, Baxter’s life’s work, was destroyed not long ago. He figures Baxter has lost everything and agrees to assist him. Once free, the Fugitoid plans to fulfill his fantasy of self-destruction. The past. New Quanin City. General Krang orders his Triceraton officer Zog to execute the children of the miners who briefly rebelled against him. Suddenly, several ships appear in the sky and begin raining fire down upon the Utrom citizens. Krang looks closer and sees that the invaders are Triceratons. Zog attacks Krang and tells him that he brought this betrayal upon himself. By spreading his Empire out so thin, he has doomed his own people, to say nothing of the countless alien races he ordered destroyed. 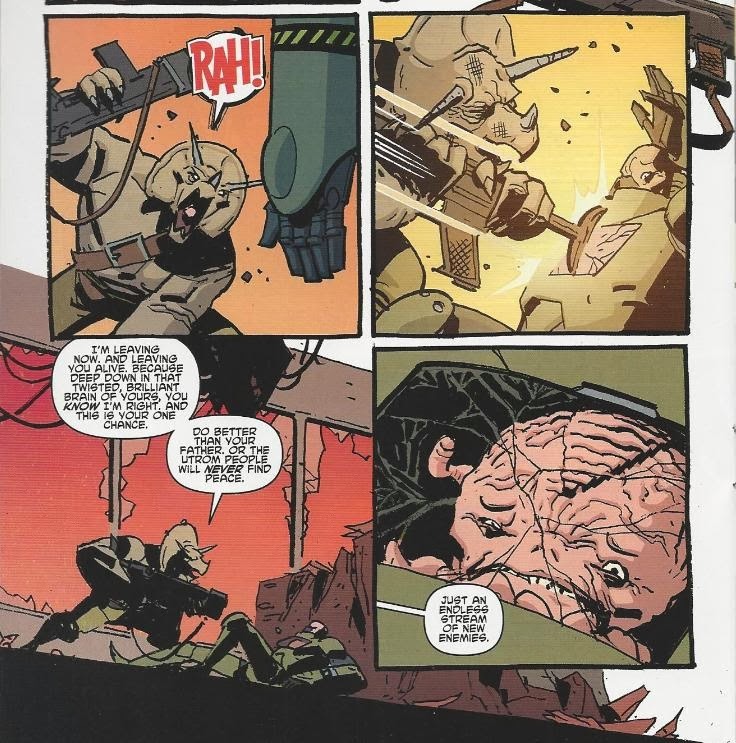 Krang calls the Triceratons ungrateful and fights back, insisting all he’s done was for the good of his people. Zog defeats him, but rather than kill him, he tells Krang that he’ll be spared on the condition that he undo the mistakes of his father, Quanin, and end all aggression. The present. Northampton, Massachusetts. In the barn, Donatello is going through some stuff April brought with her when they fled New York. Michelangelo asks what he’s after and Donnie explains that when April was raiding Stockgen, she grabbed one of the Chet’s (Fugitoid's) notebooks. Now that they’re able to catch their breath, he wants to give the notebook a read through. Opening it up, Donnie finds nothing less than a series of designs labeled “Technodrome”. Burnow Island. Baxter leads the Fugitoid to the chamber housing all the Utroms in ooze stasis. Baxter begins draining the ooze from the pods, killing the Utroms. He tells the Fugitoid that he wants to take away what Krang is fighting for: His people. By doing so, he’ll effectively “break” Krang. Not only that, but he has his own plans on using the Technodrome for himself. The Fugitoid momentarily considers letting Baxter go through with it, but having experienced the pain of losing his entire family himself, the Fugitoid refuses to let the Utroms be killed. He punches Baxter in the back of the head and says that he has a plan to fix everything. *The story continues in TMNT: Utrom Empire #2. *Chronologically, this miniseries takes place concurrently with the “Northampton” arc of the TMNT ongoing series. 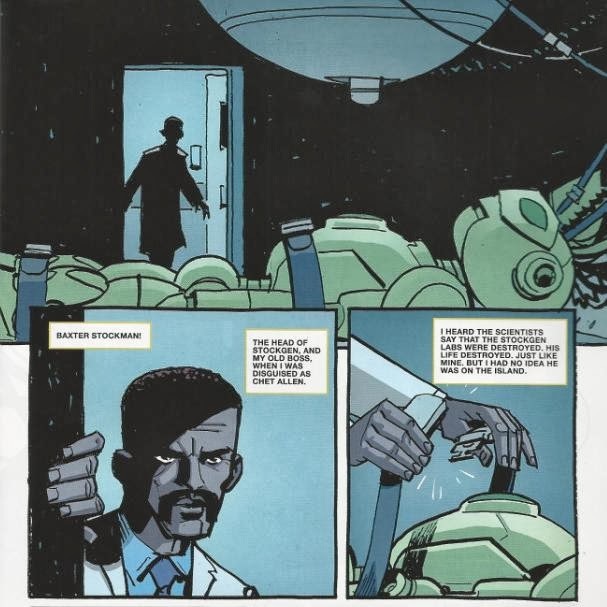 This issue in particular takes place during TMNT (IDW) #29, as Donatello is shown reading the Fugitoid's notebook in that issue. *The Fugitoid's family was killed in TMNT Micro-Series #8: Fugitoid and he was taken prisoner by General Krang in TMNT (IDW) #20. *Stockgen was destroyed in TMNT (IDW) #26. *Baxter’s machinations against General Krang were revealed in TMNT Villains Micro-Series #2: Baxter. *Zog is originally a Mirage character first properly introduced in TMNT (Vol. 1) #19. *Exactly WHY the Utroms decide to turn Earth dinosaurs into warriors will be revealed in TMNT: Turtles in Time #1. *This issue was originally published with 3 variant covers: Regular Cover by Kuhn, Cover RI by Kevin Eastman and Ronda Pattison, Subscription Cover by Nick Pitarra and Greg and Fake Petre. It feels like it’s been forever since we’ve gotten an update on the whole Krang side of things. If you’re reading these comics all chronologically, then there are 18 issues between the last Krang-related story and this one (23 if you elect to read “Utrom Empire” after “Northampton”). It’s been a long time and I’m glad to see these plot lines rolling again. Paul Allor constructs some wonderful character symmetry between our three leads: General Krang, Baxter Stockman and the Fugitoid. The Fugitoid is someone who lost everything (his family) and desperately wants to end it all. Baxter is someone who lost everything (his company) and desperately wants to seize power. And Krang is someone who lost everything (his father's Empire) and desperately wants to recapture the glory of the past. Their motivations all stem from a sense of loss, but those motivations drive them in different directions. There’s also a smidgen of warmth or sympathy applied to characters like Krang and Quanin, who in all previous appearances have been nothing more than generic overlord-type villains. The idea Allor presents is that all both characters want is what’s best for their people. Yes, they’re cruel and psychotic, but they genuinely love their race and only have their best interests at heart (expanding the Empire in Quanin’s case, reigniting the Empire in Krang’s case). But “the road to Hell is paved with good intentions,” as they say, and none of it justifies their actions. Even the Triceratons, new to the IDW series, get a bit of a heart transplant. Past incarnations have always portrayed them as a barbaric, warmongering race with only rare glimpses of Triceratons that DON’T want to rip people’s hearts out. “Savage murderers” was pretty much their uniform characterization. Zog, however, shows that he and his people crave freedom not just for themselves, but for all those flattened under the boot of the Utrom Empire. Heck, he’s even generous enough to point out that the ruthlessness of the Empire was the fault of Krang and Quanin, not the Utrom people (to say nothing of sparing Krang’s life). I especially appreciated that Allor chose Zog to be the one to deliver this speech, as Zog was one of the “good guy” Triceratons from the Mirage series (and 4Kids cartoon). So yeah, we’re getting a better feel for characters and concepts that had previously been two-dimensional. While Krang and Quanin aren’t exonerated from their actions, we can see that they aren’t blandly “evil”, either, with their motives brewing from a warped concept of altruism. It also looks like we’re going to be getting a crash course in Utrom history with this series. Lots of flashbacks, people. I liked the new origin for the Triceratons, which explains why an alien race just HAPPENS to look like Earth triceratopses while also illustrating just how far back the Utroms’ awareness of Earth goes. Loooooong before Feudal Japan, that’s for sure. What’s a bit more confusing is trying to keep track of the Krang/Quanin chronology. Between TMNT (IDW) #14, TMNT (IDW) #18, TMNT Micro-Series #8: Fugitoid, TMNT Villains Micro-Series #1: Krang, Secret History of the Foot Clan #4 and this, the timeline of the Utroms is a freakin’ puzzle. It doesn’t help that the flashbacks from those various issues hop back and forth all over the timeline and it gets increasingly difficult to keep facts straight. For example, why is Krang so pleasant in the earliest flashbacks in this issue? They have to take place after his Micro-Series, as he’s a General in these flashbacks and Quanin is an Emperor. But if that’s the case, Krang should be the cruel monster he evolved into during the events of his Micro-Series, not the merciful party animal he was before the events of the Micro. And was the Iron Demon Krang, Quanin or somebody else? We’ve been dying to know that for a while, now. Anyhow, all criticisms about confusing flashbacks aside, it was still a well-crafted introductory issue. These characters have been stewing on the backburner for a while now and I’ve been anxious to check in with them again. Allor does some solid work with the cast and throws an excellent curveball with the origin of the Triceratons. Kuhn’s art is some of the strongest we’ve seen from him, nailing some moody layouts. Well just because Krang became more serious in his micro doesn't mean he couldn't celebrate a victory. He probably didn't become the brutal Krang we see now until his father's empire fell. Also, Krang wasn't the absolute ruler of the Utrom Empire yet, Quanin was still alive. Yes, if you could just collate all of the IDW Utrom data and make us a nice, clean chart, that'd be greeeeaaaat. Also, I'm gonna need you to come in on Saturday. Seriously I don't see what people like about it, I hated the artwork so much through whole Krang war/ Slash saga which was issue's 13-16 if I'm correct, he even did the art for the Michelangelo micro and that looked awful too, the Turtles have this bulky ugliness and their faces seem to resemble confused rodents most of the time. I personally with Santilouco could stay on for good and the Ross Campbell look kind of looks too "cute" or just too soft for the TMNT in my opinion. Why was Krang so pleasant in the earliest flashback, you ask? The answer is: he's shitfaced. With mugs as big as they've got, it's probably going to plaster him up pretty quick. Utroms having a picnic! C moooooooon. They had always gone over the limits to humanize aliens but that was the final straw. Story artist trying so hard to make overall story to be parody or pastiche of something else. But why? Is it that hard to writing somethin a little bit unique?